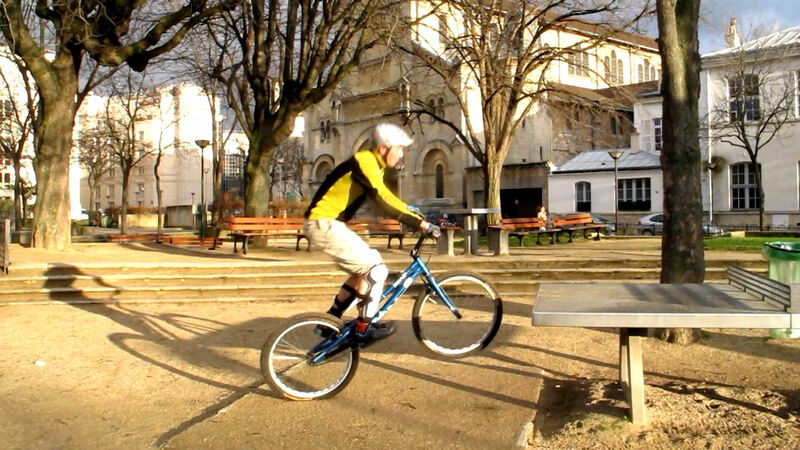 In situations where the obstacle would be beyond the reach of a regular side hop or pedal hop, an alternative is to reach the top of the obstacle with your front wheel first and then use your momentum to tilt the bike forward. Landing upstream with precision, Benito Ros. 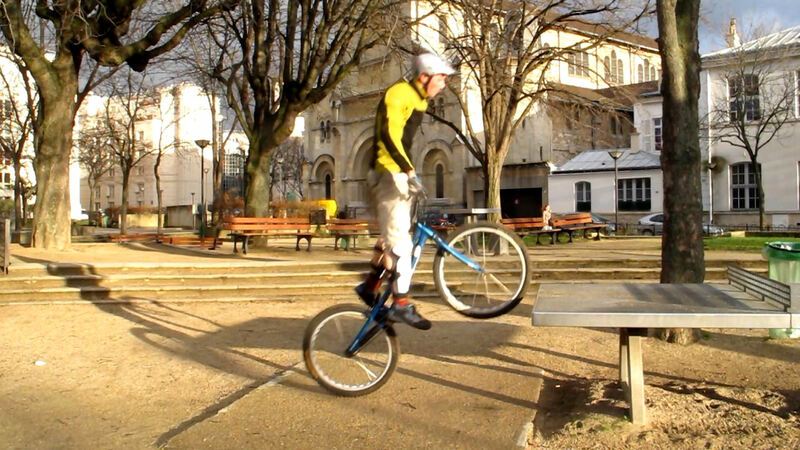 The nose-pick technique enables a pure weight transfer over the gap and can offer much more grip control and fluidity upon landing than a side hop. This is especially true in difficult natural sections where it will avoid the stupid dabs that are typical with the less elaborate "hit-or-miss" approach of big side-hops. This approach is really an extension of the pedal hop landing on the front wheel, but with extra emphasis on the jump impulse and body language to go upward like in a side hop to front wheel. Ready to pick the front wheel on a rock and tilt the bike. 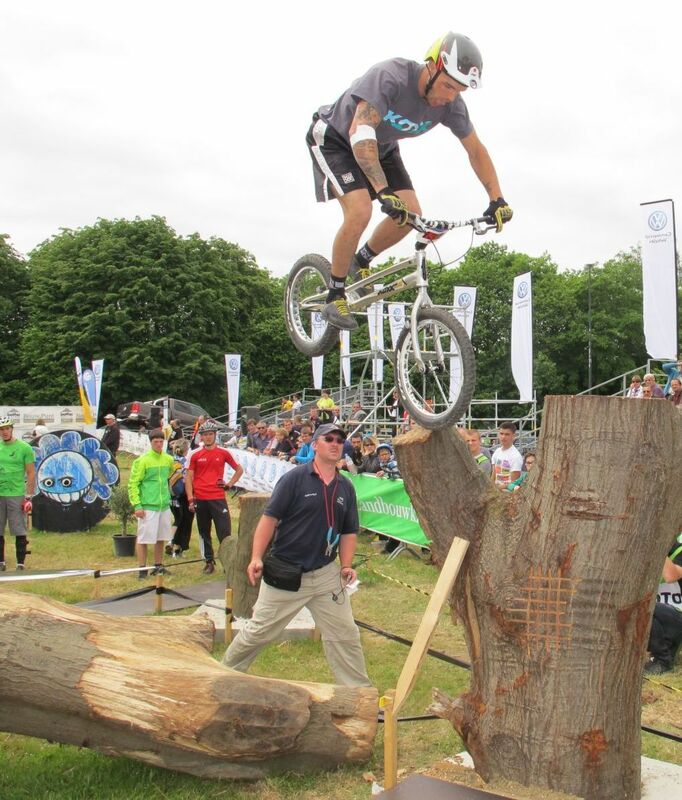 From a standing position, find your balance over the rear wheel at just about a bike's length from the obstacle. Crouch back and lower the front wheel to get extra torque and compress the rear tyre right on the edge before the pedal kick. 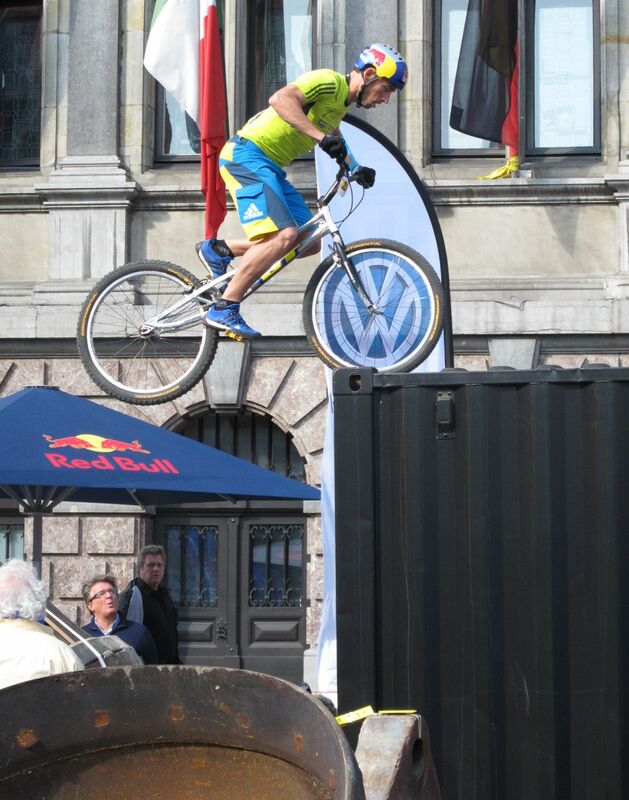 Abel Mustieles in a power transfer to front wheel. Pull yourself on the bars and spring upward into extension, thrusting your hips and shoulders upward while standing on your strong foot before the pedal kick. Try from a trackstand just to feel the right move. Only release the brake to finish up your jump impulse with a strong pedal kick. The full extension should bring your shoulders over the handlebars, with your abdomen right over the stem, the front wheel moving up again. 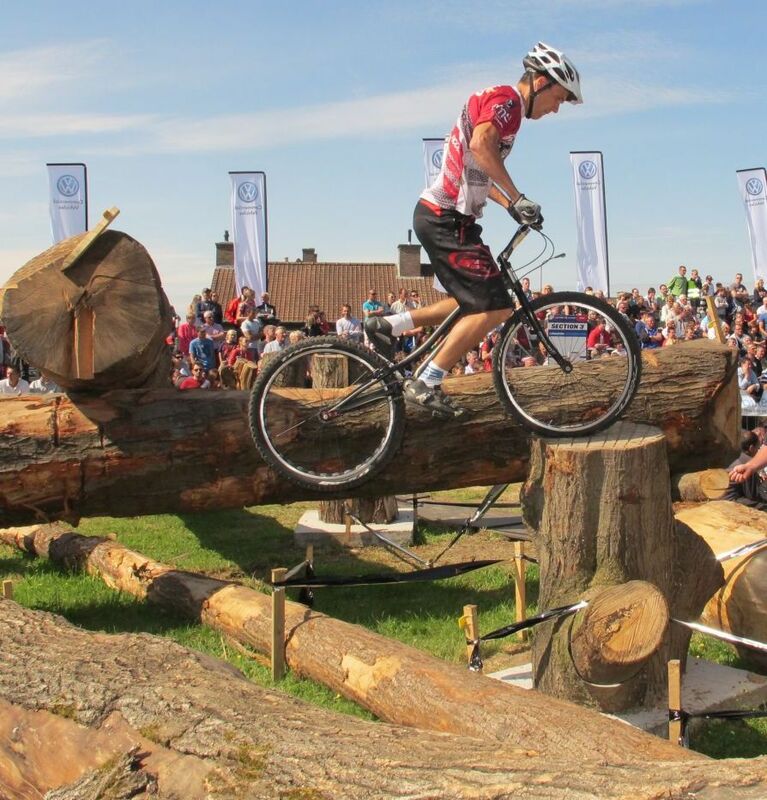 As soon as the rear wheel takes-off, aim the front wheel right at the top of the obstacle. 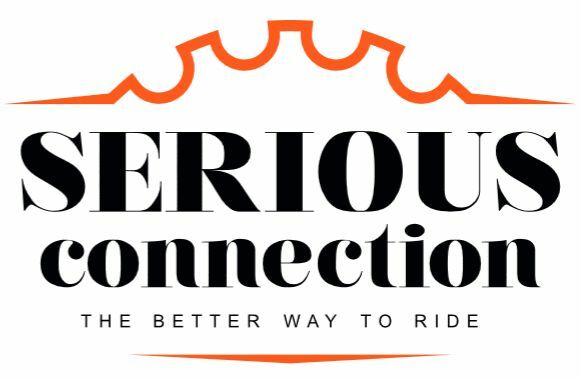 As the front tyre reaches the edge, lock the front brake to tilt the bike forward and use your own momentum to transfer your weight further over the front wheel, tucking your knees nearer the handlebars. Once your shoulders are safely over the obstacle, release the front brake progressively, and carry on with your momentum. Extend your arms to push the bike on the front wheel and clear the rear wheel away from the gap. Kenny Belaey in full extension, taking aim with the front wheel. Vincent Hermance nailing the front wheel just before a wheel swap. You should end up with your arms fully stretched, either balancing on the rear wheel after a wheel-swap, or with both wheels secured onto the obstacle. Because you land on the front wheel first, the height you must reach up from a balanced position on the rear wheel is much lower than if you had to hop directly to back wheel, making this move very energy efficient. Also, going front wheel first gives you more visibility, so you can choose the patch that has the best grip to support your front wheel. By controlling your weight transfer over the front wheel, flexing your arms if need be to get closer, you will determine how easy it will be to tilt the bike. But the most important part is to build enough momentum upwards, hence flex well before you jump. 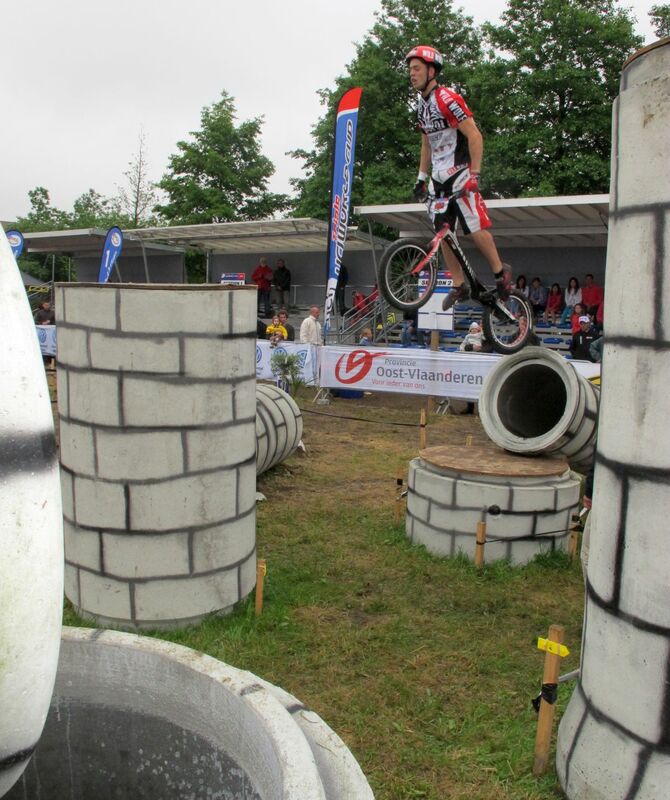 1° From a standing position, find your balance over the rear wheel at just about a bike's length from the obstacle. 2° Crouch back and lower the front wheel to get extra torque and compress the rear tyre right on the edge before the pedal kick. 3° Pull yourself on the bars and spring upward into extension, thrusting your hips and shoulders upward while standing on your strong foot before the pedal kick. 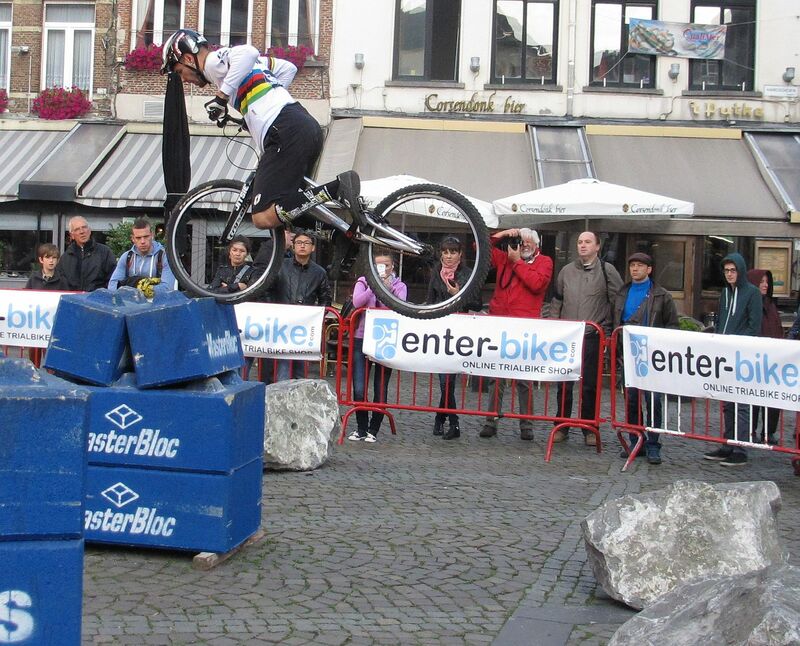 4° The full extension should bring your shoulders over the handlebars. 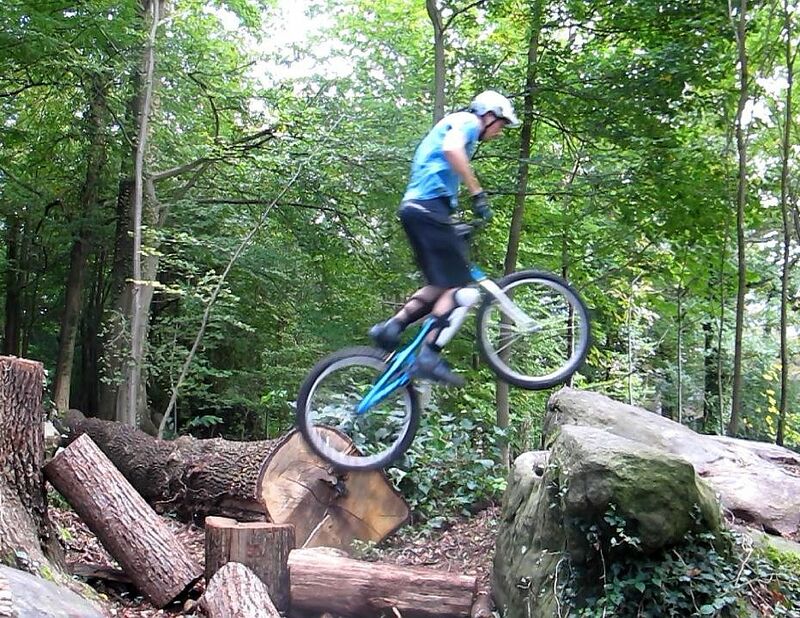 As soon as the rear wheel takes-off, aim the front wheel right at the top of the obstacle. 5° As the front tyre reaches the edge, lock the front brake to tilt the bike forward and use your own momentum to transfer your weight further over the front wheel, tucking your knees nearer the handlebars. 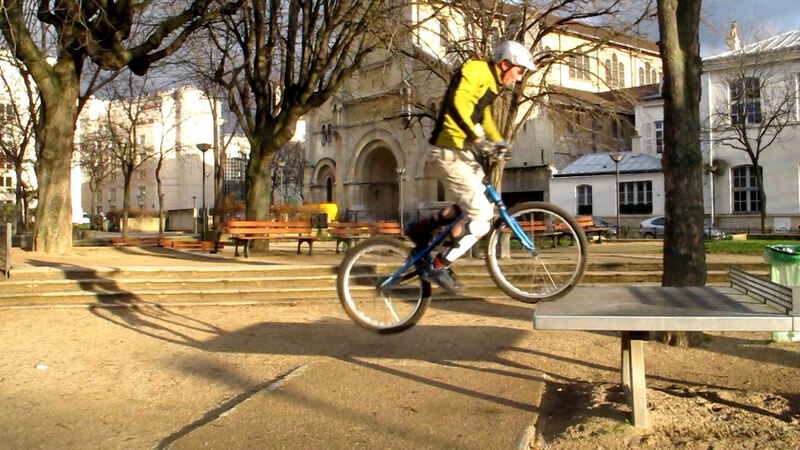 6° Once safely over the obstacle, release the front brake progressively and carry on with your momentum. Extend your arms to push the bike on the front wheel and clear the rear wheel away from the gap. Vincent Hermance flexes his arms to dive over the handlebars. Kenny Belaey tucks nearer the front wheel. 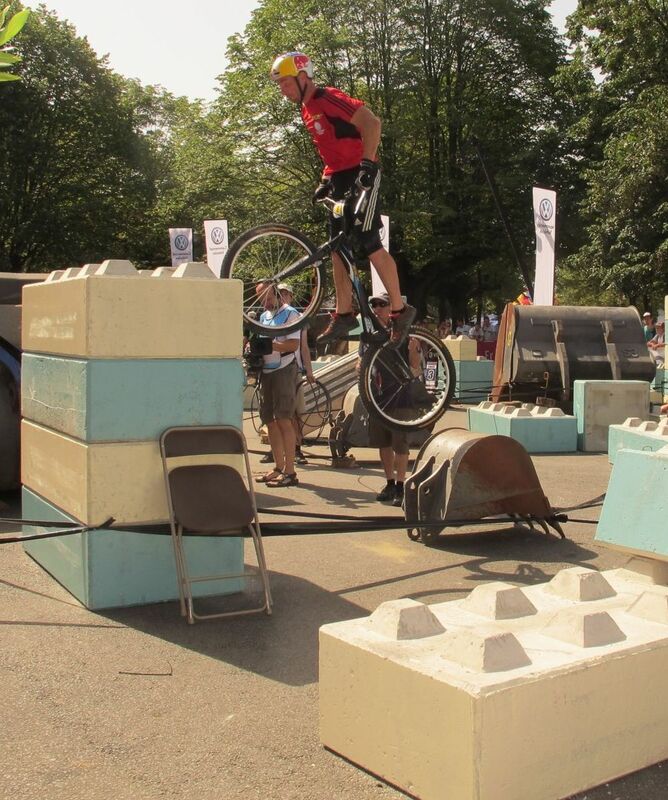 The only drawback of this technique is the mental block that comes with the fear of missing the obstacle with your front wheel (this mishap often results in a scary crash). Although it is counter-intuitive, for an optimum pedal kick impulse, you should lower the front wheel quite below the upper edge of the obstacle. You only need to lift the front wheel up again when you finish off the pedal kick into a full extension. At the beginning, it is easier and safer to practise this technique from a trackstand. For example, you could start in front of a kerb. That gives you plenty of time to prepare yourself and you only have to focus on your weight transfer, not on your balance over the rear wheel. Nicolas Vuillermot flexes his arms to lean further over the handlebars. 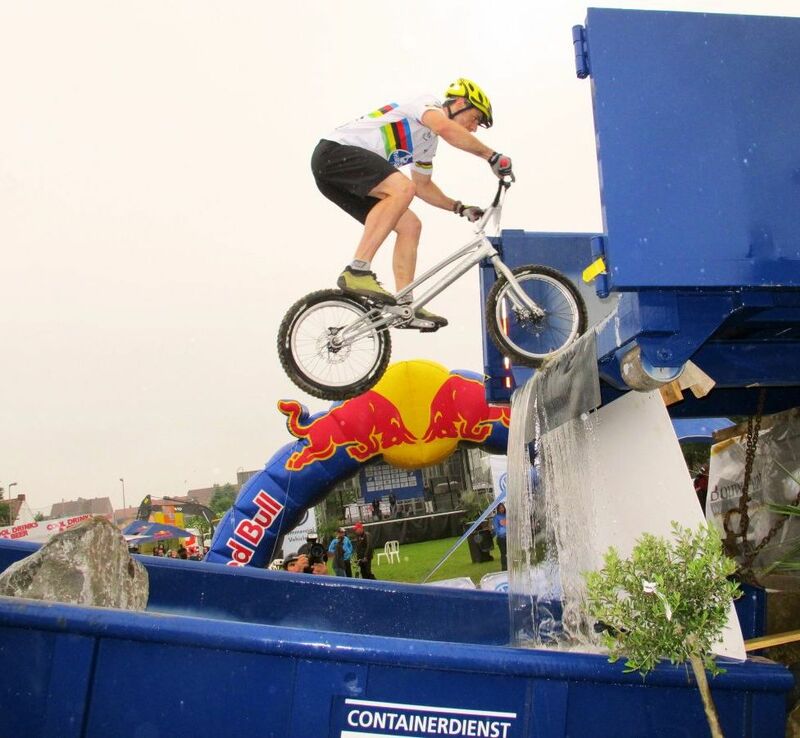 The higher the obstacle in front of you, the higher you will have to pull the bike up against your torso, hence the more you will have to flex your arms upon reception on the front wheel. Flexing your arms allows you to dive over the handlebars and tilt the bike on its front wheel with more momentum. Riders ususally tend to keep their arms straight, which doesn't really help. By lowering your abdomen over the stem (flexing not only your knees but also your arms), you will also be in a much better position to withstand the impact and control the tilt.